Enlisted November 07, 1941 as aviation cadet. Went to Shaw Field, Sumter, SC for the next level of flying training: Basic. Graduated in class of 42G, S/N: O-790605. He served in 324th Fighter Grp 316th Fighter Sqdn and transferred to 33rd Fighter Grp 059th Fighter Sqdn. Went to Shaw Field, Sumter, SC for the next level of flying training: Basic. Graduated Spence field, S/N: O-791041 in the class of 42G. Retired disabled Dec 19 1944. 381st Bomber Grp. Killed in action. Air Medal & 2 Oak Leaf Clusters & Purple Heart from findagrave.com. He won the Air Medal twice for hazardous flying in the Alaska-Aleutian Theater and retired as a Lieutenant Colonel. Graduated from Midland AAFd (class of 42-09) S/N: O-661581 as a bombardier. Served with 11th Bomber Grp 98th Bomber Sqdn as a bombardier. Missing in Action May 4, 1944 (MACR #04622) after leaving from Eniwetok Atoll on a bombing mission on Ponape Island. Went to Shaw Field, Sumter, SC for the next level of flying training: Basic. Went to Shaw Field, Sumter, SC for the next level of flying training: Basic. Graduaed S/N: O-790611. Served with 50th Fighter Grp 313th Fighter Sqdn and was killed in a flying accident on Dec 12, 1942 in Florida while flying P-40E. Graduated with the class of 42-11 as a navigator, S/N: O-728163. Served with 91st Bomber Grp 401st Bomber Sqdn as a navigator and was missing in action on Jan 02, 1943. Graduated with the class of 42-13 at the bombardier school in Midland, Texas, S/N: O-664730. Served with 345th Bomber Grp 501st Bomber Sqdn as a navigator/bombardier. Went to Shaw Field, Sumter, SC for the next level of flying training: Basic. Served with 345th Bomber Grp 499th Bomber Sqdn as a B-25 pilot. Went to Shaw Field, Sumter, SC for the next level of flying training: Basic. Graduated as a navigator from Turner Field class of 42-10, S/N: O-790939. Retired disabled on February 7, 1945 and died December 18, 1948. Went to Shaw Field, Sumter, SC for the next level of flying training: Basic. Graduated with the class of 42F at the pilot school in Dothan, Alabama, S/N: O-790796. Served with 500th Bomber Grp 833RD Bomber Sqdn as a B-29 pilot. Went to Shaw Field, Sumter, SC for the next level of flying training: Basic. Graduated with the class of 42-11 at the navigator school at Turner Field, S/N: O-791569 served with 090th Bomber Grp 400th Bomber Sqdn as a B-24 navigator and was missing in action on Jan 22, 1943. Served with 310th Bomber Grp 380th Bomber Sqdn in the Mediterranean Theater. Graduated with the class of 42-11 at the navigator school at Turner Field, S/N: O-729608. Served with 090th Bomber Grp 320th Bomber Sqdn as a B-24 navigator in the Southwest Pacific. Went to Shaw Field, Sumter, SC for the next level of flying training: Basic. Served with 090th Bomber Grp 400th Bomber Sqdn in the Southwest Pacific. Went to Shaw Field, Sumter, SC for the next level of flying training: Basic. Graduated with the class of 42F at the pilot school in Dothan, Alabama, S/N: O-790808. Served with 303rd Bomber Grp 427th Bomber Sqdn as a B-17 pilot. Went to basic at Shaw Field, SC. Ed Goodman was his Instructor at Douglas. Went to basic at Shaw Field, SC. Ed Goodman was his Instructor at Douglas. Later, he took Ed for his first flight over “the Hump”. Went to Shaw Field, Sumter, SC for the next level of flying training: Basic. Graduated with the class of 42F at the pilot school at Moody Field. Served with 310th Bomber Grp as a pilot in the Mediterranean Theater. Went to Shaw Field, Sumter, SC for the next level of flying training: Basic. Graduated with the class of 42F at the pilot school at Turner Field, S/N: O-790329. Served with 321st Bomber Grp 447th Bomber Sqdn as a pilot in the Mediterranean Theater. Graduated with the class of 42F at the pilot school at Turner Field, S/N: O-791202. Served with the 17th Bomber Grp 432nd Bomber Sqdn as a B-26 pilot and was killed in action on Jan 7, 1943. Served at Selman Army Air Field as a pilot flying navigator cadets around Louisiana and the Gulf Of Mexico. Went to Shaw Field, Sumter, SC for the next level of flying training: Basic. Trained at Reno Army Air Base learning to fly the C-46 transport plane. Went to Shaw Field, Sumter, SC for the next level of flying training: Basic. Graduated with the class of 42F at the pilot school at Turner Field, S/N: O-790335. Served with 319th Bomber Grp as a pilot in the Mediterranean Theater. O’Rear Treadaway was his Instructor, whom he describes as a patient instructor. He went to Basic at Shaw Field, SC. and Moody for Advanced. Then checked out in A-20’s at Key Field in Meridian, Miss. After six months of training, he flew to North Africa via South America. He was assigned to B-25’s with the 310th Bomb Group in North Africa. Back in the U.S. he was assigned to ferry planes, mostly P-51’s and P-38’s from factories to their U.S. destinations. After discharge, he became a high school teacher.Click here for his picture. He “washed out” at Douglas. Washed out at Douglas. Returned to Maxwell (the southeast regional flying base). Graduated at the navigator school at Turner Field on July 4, 1942, S/N: O-790246. Served with the 96th Bomber Grp 339th Bomber Sqdn as a B-17 navigator and became prisoner of war on July 28, 1943, incarcerated at Luft Stalag 3. Graduated at the navigator school at Turner Field on July 4, 1942, S/N: O-790251. 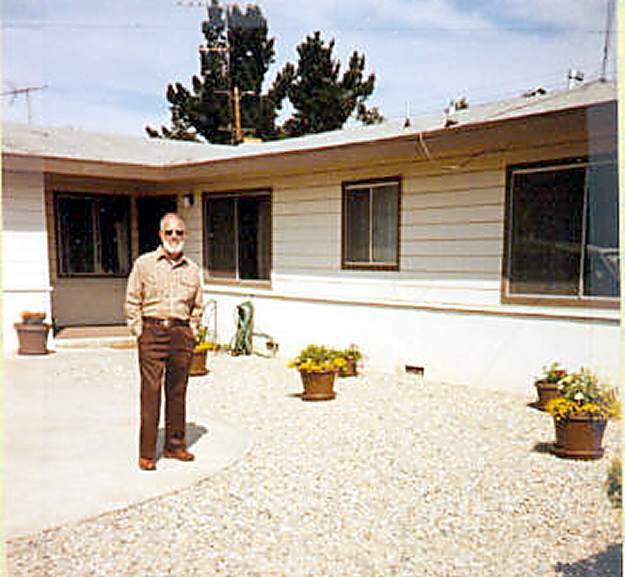 Served in N. Africa as a B-17 navigator and became a prisoner of war. Was incarcerated at Luft Stalag 3. Went to Shaw Field, Sumter, SC for the next level of flying training: Basic. Stayed in the service after the War. 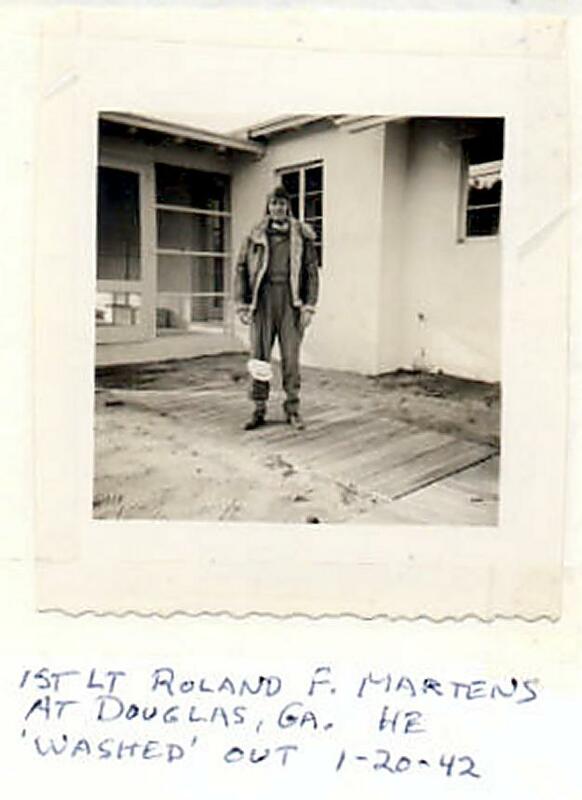 On Aug 19, 1951, he was in a flying accident in Detroit, MI when flying out of Bergstrom Army Airfield in TX in a F-84E. Went to Shaw Field, Sumter, SC for the next level of flying training: Basic. Graduated with 42F, S/N: O-790856. Served in the Pacific with the 307th Bomber Grp 371st Bomber Sqdn as a B-24 pilot and later with the 11BG 26th Bomber Sqdn. Retired on April 1 1966 as a Lt Col USAF. Went to Shaw Field, Sumter, SC for the next level of flying training: Basic. Graduated with 42F, S/N: O-790684. Served as a B-24 pilot in the 486th Bomber Grp 834th Bomber Sqdn and later with the 493BG 862th Bomber Sqdn. He had Basic at Shaw Field. He graduated and flew Bombers in Europe. As a civilian he was in the Insurance Business. Went to Shaw Field, Sumter, SC for the next level of flying training: Basic. Graduated with the class of 42F at the pilot school at Turner Field, S/N: O-790376. Served with 310th Bomber Grp 380th Bomber Sqdn as a pilot in the Mediterranean Theater and became a prisoner of war on May 21, 1943 in Germany. Enlisted 11/06/1941 Columbia, SC. Served as a C-46 pilot in the 2nd Combat Cargo Group 8th CCS in the China Burma Theater. Served in the 30th Infantry Division 119th Regiment Co. K and was killed on October 10, 1944 in Germany. Went to Shaw Field, Sumter, SC for the next level of flying training: Basic. Graduated with 42F, S/N: O-790704. Served as a B-24 pilot in the 464th Bomber Grp 776th Bomber Sqdn. Taught gunnery and was assigned to instrument training. See bio. O-790883. Served as a B-17 pilot in the England with the 305th Bomber Grp 422nd Bomber Sqdn and was missing in action on May 9, 1943. Went to Shaw Field, Sumter, SC for the next level of flying training: Basic. Graduated with 42F at Moody Field, S/N: O-790885. Served as a B-26 pilot with the 320th Bomber Grp 443rd Bomber Sqdn. Graduated with 42C at the Officers Candidate School in Miami Beach, Florida, S/N: O-562174. Served as a Special Services Officer with the 307th Bomber Grp 372nd Bomber Sqdn and was killed in a flying accident on March 20, 1944 while riding in a transport plane near New Caledonia. Went to Shaw Field, Sumter, SC for the next level of flying training: Basic. Graduated with the class of 42F at the pilot school at Turner Field, S/N: O-790419. Served with 321st Bomber Grp 446th Bomber Sqdn as a pilot in the Mediterranean Theater. Went to Shaw Field, Sumter, SC for the next level of flying training: Basic. Graduated with the class of 42F at the pilot school at Turner Field, S/N: O-790423. Served with 38th Air Depot Group as a pilot in the Mediterranean Theater and was killed in a flying accident on July 9, 1944 in Italy. Went to Shaw Field, Sumter, SC for the next level of flying training: Basic. Graduated with 42F, S/N: O-790736? Served as a B-29 pilot with the 505th Bomber Grp 482nd Bomber Sqdn. Retired USAF. Went to Shaw Field, Sumter, SC for the next level of flying training: Basic. Graduated with the class of 42F at the pilot school at Turner Field, S/N: O-790427. Served with 38th Bomber Grp 405th Bomber Sqdn as a pilot in the Southwest Pacific and was Missing in Action on November 27, 1944. Graduated as a bombardier with the Class of 42-14 at Victorville Army Air Field (Calif) S/N: O-731433. He was first assigned to B-24’s with the 307th Bomb Group and reassigned to the 11th Bomb Group 98th Squadron, with which he was lost in the South Pacific on January 20, 1944 with the Charles E. Hopkins crew. Went to Shaw Field, Sumter, SC for the next level of flying training: Basic. He crashed at Barksdale Field, LA in B-26A #41-7448 on October 20, 1942. He was training with the 335TH Bomb Group 475th Bomb Squadron and apparently crashed on the field. According to the Tipton Tribune newspaper dated Oct 23 1942 (page 6) he died in the station hospital on the 21st of October along with his copilot. He washed out at Douglas. He went into Anti-aircraft, 41st Sqdn. Graduated with 42F at Spence Field, S/N: O-790743. Served as a P-40 pilot with the 324th Fighter Grp 316th Fighter Sqdn. Went to Shaw Field, Sumter, SC for the next level of flying training: Basic. Graduated with 42F at Moody Field, S/N: O-790891. Served as a B-17 pilot with the 303rd Bomber Grp 359th Bomber Sqdn and was killed in a flying accident on March 3, 1944 while flying an RAF Havoc light bomber in Ireland. Graduated with 42F at Moody Field, S/N: O-790892. Served with the 27th Bomber Grp 17th Bomber Sqdn and was killed in a flying accident on September 11, 1942 while piloting an RAF Havoc light bomber in Louisiana. 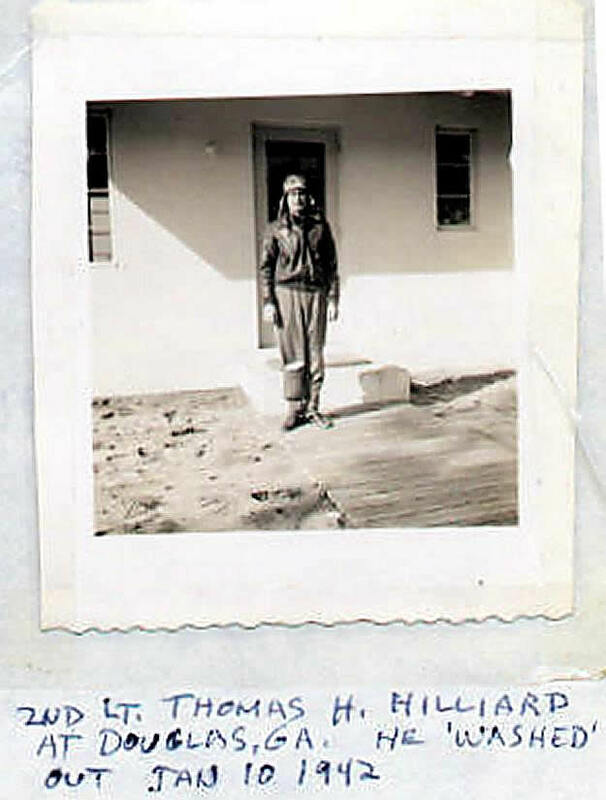 Graduated at the bombardier school at Hobbs Army Air Field on November 21, 1942, S/N: O-733573. Served in Italy with the 99th Bomber Grp 346th Bomber Sqdn as a B-17 bombardier.